Some cars look simply stunning in white. The new C-Class is not one of them, sadly. The pair of crisp curves that arc along the flanks of Mercedes’ new medium-sized saloon seem to fade away in the pale paint, leaving the impression of a slightly bland and blobby, cigar-shaped car. At least the new car’s stance survives the colourless paintwork. The cabin has been pushed ever so slightly further back along the body than in the old C-Class, creating the impression of an elongated bonnet and stubby tail. The result seems more imperious than the outgoing car, helped by an echo of S-Class about the neat rear end. And by the fact that the new car is actually more substantial than the old one – length has risen by 10cm overall, while the wheelbase is 8cm longer. You notice the extra legroom in the rear, where there’s also a very happy looking ventilation system to keep back-seat passengers cool or toasty. Headroom is about the same as before in the back, though there’s more room to wear a hat up front due to a lower seating position. Combined with shallower glazing, the new C-Class feels a little more wrapped around the driver than before, though thankfully all-round vision remains good. The boot has gained a few litres compared to the prior body shape, now matching the 480 litres offered by BMW’s 3-Series and Audi’s A4. Today’s test car also gains a little extra attitude courtesy of its AMG Line trim, sitting 15mm lower than standard on 18-inch alloys. Surprisingly, these two tweaks haven’t ruined the ride because the car is now blessed with adaptive suspension as standard throughout the range. Run your finger over the driving mode switch – a tactile little metal cylinder on the central tunnel – and things can be toughened up from the default Comfort setting (which is indeed very comfortable) through to Sport or Sport Plus (neither of which feels persuasively sporty, though the more extreme setting definitely ain’t comfy any more). 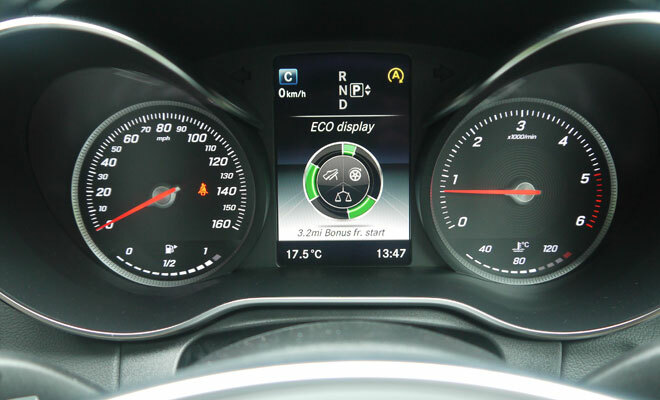 Or you can scroll the other way into Eco, which softens the car up to the point where you may well nod off. Fortunately there is a safety system that detects drowsy driving and will squawk and suggest a coffee. The mode selector is one of many jewel-like details scattered throughout a vastly improved interior. The new C-Class cabin can reasonably lay claim to first prize among like-priced alternatives. While not everything that looks metal is actually made of metal – the hyper-sensitive electric window switches, for example, feel like painted plastic – the overall look and feel of the cabin has taken a big stride forward. 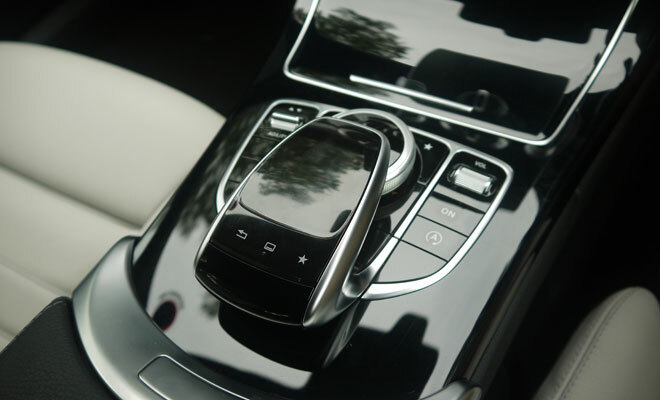 Another welcome change is the move to an automated electronic handbrake as standard, which has removed the old pedal-operated affair that cluttered up the footwell. Information is also better presented than before. The new instrument panel is much clearer and less fussy, though the new circular eco driving tutor, which can be summoned onto the bright digital screen between the clocks, remains as baffling as ever. Designed to provide feedback, to try to encourage smoother driving and improved anticipation, the tutor seemed not to like my driving no matter what I did. It does, however, encouragingly tell you how many miles you might have gained through careful driving, aided by an engine stop-start system fitted to both manual and automatic editions. The central seven-inch screen and its multi-purpose controller at your elbow provide another area of welcome improvement over the old car. It’s now much easier to navigate though the various screens with a twist, swipe or prod. The touch-sensitive upper surface of the controller means you can spell out words with a fingertip rather than picking letters laboriously from an on-screen list, and the satnav seems quick at zeroing in from a postcode or searching from the first few letters of an address. The design and organisation of the on-screen software isn’t quite up to the same slick standard as BMW’s equivalent, but it’s now close enough rather than miles behind. 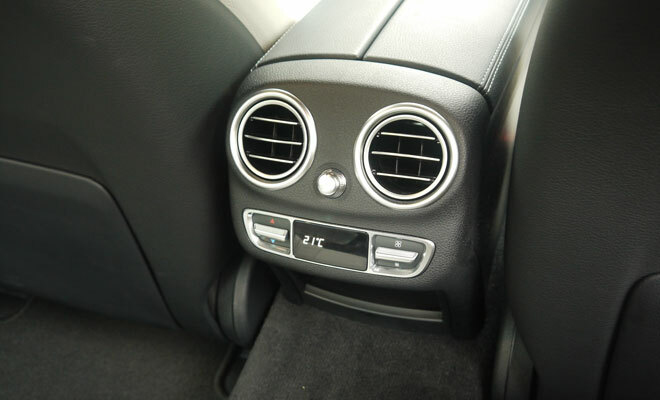 Our test vehicle is a C220 BlueTec with seven-speed automatic transmission. Its 2.1-litre diesel engine can muster up to 170bhp and 400Nm of torque, identical figures to the C220 CDI BlueEfficiency model I tested last year. Acceleration has improved compared with the previous generation, however, aided by a modest 50kg reduction in weight as well as squeaky clean aerodynamics. A six-speed manual C220 can now scrabble to 62mph in 7.7 seconds, compared with 8.4 seconds in the older car. Today’s automatic is quicker still, reaching 62mph in just 7.4 seconds. Despite this more eager turn of speed, official consumption is improved compared with a year ago. The basic manual C220 is now rated at 103g/km, down from the 109g/km scored by the old C220. An automatic C220 now starts at 109g/km, in modest SE trim with 16-inch wheels, rising to 113g/km for the AMG Line and its bigger wheels. Sport trim, with its middle-sized 17-inch wheels, provides a rating of 104g/km with manual gears or 110g/km with an auto box. 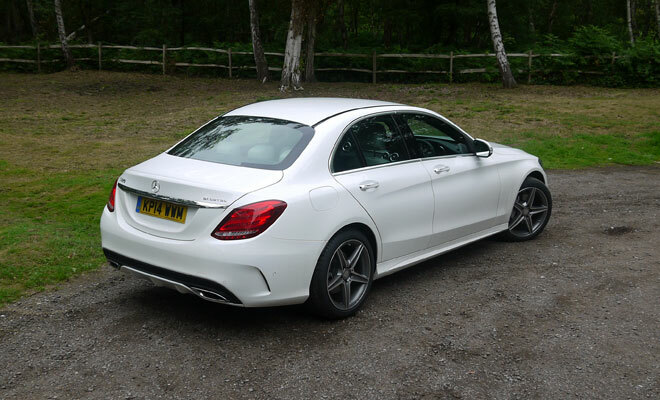 Our test car – a C220 AMG Line auto – boasts a 113g/km CO2 score, 65.7mpg for combined economy and costs from £34,355. 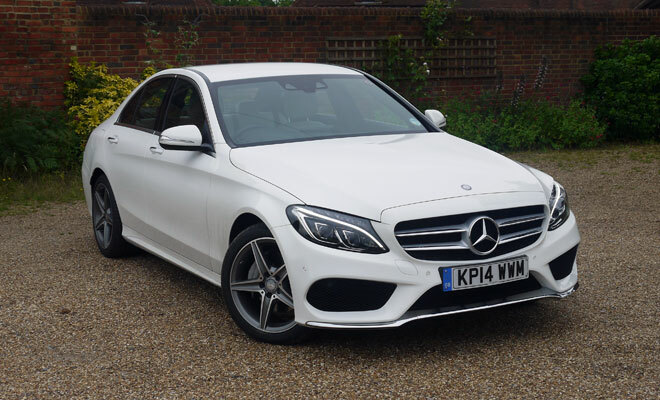 A diesel-electric C300 hybrid version of the C-Class is more economical – rated at 94g/km and 78.5mpg – though it will drain another £5,000 or so from your bank balance. 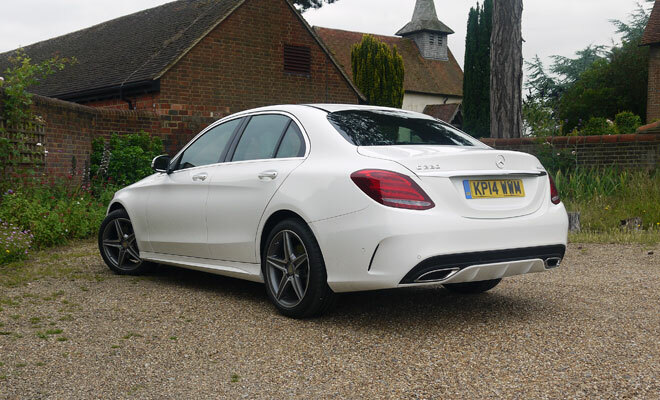 The hybrid ought to be quieter, however, because the C220’s engine is not remotely silent. It will bark hoarsely when worked hard, or settle to a disgruntled growl when given less demanding work to do. Vibration is well contained, but the din spoils what would otherwise be a very refined and relaxing interior. 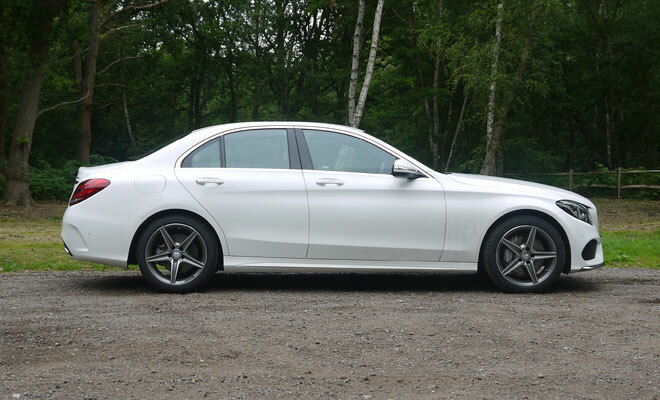 The C220 in base SE guise starts at £29,365, with an automatic gearbox costing £1,500 extra. Another £1,995 lifts the trim to Sport setting, which brings 17-inch wheels, LED headlamps, Garmin navigation and a Park Assist package among other improvements. The top AMG Line trim costs another £1,495 on top of Sport and gains 18-inch alloys, beefed up bumpers of dubious artistic merit, interior glitz including a stitched cover for the dashboard, plus sportier seats, steering and suspension. Our test car also featured soft, pale leather upholstery, a £795 option. Artificial leather comes as standard. 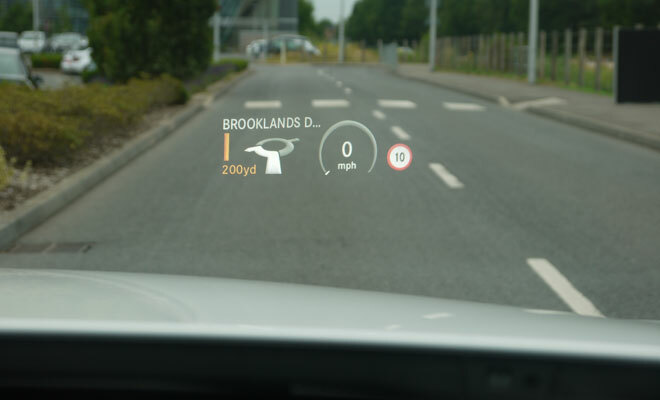 We were also treated to a head-up display, which costs £825 and throws an impressive quantity of crisp and colourful information onto the lower quarter of the windscreen. The display includes the current speed limit and, when navigating, clear directions complete with road names and junction countdowns. I’m not sure I really approve of the slightly cluttered result. With HUDs, I suspect less may be preferable to more. Overall, the new C-Class feels like a big step up from the previous model, especially in the interior. Everything you might touch feels better than before, and is now at least as kind to the fingers as the competition. Technology is also vastly improved and is now good enough to compete with BMW. Improvements to fuel economy also keep the new C-Class firmly among the best in the business.